Oxford Magnet Technology, now Siemens Magnet Technology (SMT), supplies scanners for hospitals and universities all over the globe. 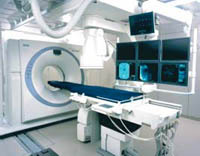 SMT is a world leader in the manufacture of super-conducting magnets for magnetic resonance imaging (MRI) systems and has secured numerous Queen’s Awards for export. Their largest markets are in the United States and the Middle East. Scanners are complex, sophisticated pieces of equipment that must be rigorously tested and manufactured to the highest standards. They are high-volume pieces of medical equipment – thousands of patients rely on them to detect a malignant growth or confirm that they are in the clear. Without technology contributed from the air conditioning industry, scanners would not function. Two of the key components are the power supply and the gradient coil. The temperatures within these components must be precisely controlled to ensure sharp images. ServerCool first designed and supplied SMT with a unit to cool a power supply module and magnet in 1995. This was a first for ServerCool and required some innovative design and development work. For this project, reliability and good design, with an emphasis on size reduction, were key considerations. Careful selection of materials and components was also critical. ServerCool’s design had to ensure that the system could control water temperature at plus or minus 0.5° centigrade. ServerCool’s expert, in-house design team is used to combining technical expertise, research and design to provide economical, customized solutions. Engineers designed the cooling system to operate remotely from the actual scanner. Once the scanner is activated, the cooling unit switches on automatically and circulates water through a series of tubes within the gradient coil and the heat sink within the power supply. The whole system is a closed loop. Since this first project, ServerCool has extended its scope of supply to four coolers and ancillaries to three end users (via SMT).